This gallery contains some photos of the Benedictine Ettal monastery in southern Bavaria, one of most visited pilgrimage centres in Germany. 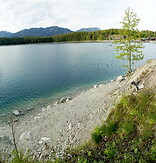 The Eibsee is a small lake near the Zugspitze, the hightest mountain in Germany. The Tegernsee is an alpine lake in southern Bavaria.